Foxes are small-to-medium-sized, omnivorous mammals that belong to several genera of the family Canidae. A fox’s main characteristics are: a flattened skull, upright triangular ears, a pointed and slightly upturned snout, and a long bushy tail referred to as a brush. Species of foxes differ in fur color, length, and density. A fox’s fur coat ranges from pearly white to black and white to black flecked with white or grey on the underside. A fox’s fur coat color and texture may vary due to the change in seasons and a fox’s age. Fox pelts are richer and denser in the colder months and lighter in the warmer months. To get rid of the dense winter coat, foxes moult once a year around April. This process begins from the feet, up the legs, and then along the back. Foxes live on every continent except Antarctica. By far the most common and widespread species of fox is the red fox with about 47 recognized subspecies. The global distribution of foxes, together with their widespread reputation for cunning, has contributed to their prominence in popular culture and folklore in many societies around the world. Roald Dahl‘s Fantastic Mr Fox is one example. The hunting of foxes with packs of hounds is a long established pursuit in Europe, especially in the British Isles, is a still controversial issue. Red foxes which are typical in UK contrast the other species such as the Fennec and Artic foxes with a typical auburn pelt and their tail normally ends with white marking. 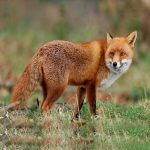 Diet: Red foxes primarily feed on small rodents such as voles, mice, ground squirrels, hamsters, gerbils, woodchucks, pocket gophers and deer mice. Secondary prey include birds, leporids, porcupines, raccoons, opossums, reptiles, insects, marine mammals, fish and echinoderms. Red foxes readily eat plant material, and in some areas fruit can amount to 100% of their diet in autumn. Commonly consumed fruits include blueberries, blackberries, raspberries, cherries, persimmons, mulberries, apples, plums, grapes, and acorns. Other plant material includes grasses, sedges and tubers. Habitat: In the wild, the typical lifespan of a fox is one to three years, although individuals may live up to ten years. Unlike many canids, foxes are not always pack animals. Typically, they live in small family groups. Red foxes either establish stable home ranges within particular areas or are itinerant with no fixed abode. They use their urine to mark their territories. Outside the breeding season, most red foxes favour living in the open and enter their burrows to escape bad weather. They dig burrows on hill or mountain slopes, ravines, bluffs, steep banks of water bodies, ditches, depressions, gutters, in rock clefts and neglected human environments. Impact: Red foxes hunt game birds, hares, rabbits, and so forth for their food. In particular, poultry and ground nesting birds on farm land, commercial land is one source. They also also know to hunt through scraps of refuse bins and bin bags left on the street. Chickens should be kept in secure coops with a secure mesh heavy gauge fence around them. At least 5 and a half feet tall. The fence should have outward-angled wire overhangs and buried wire aprons. Install motion sensor security lights on your home, garage, chicken coops, and sheds. Sudden lights showing help to scare them away.